Zottel is the mascot for SVP, the far right political party in Switzerland. They're infamous for their controversial election campaigns. To read my posts related to them, click here. 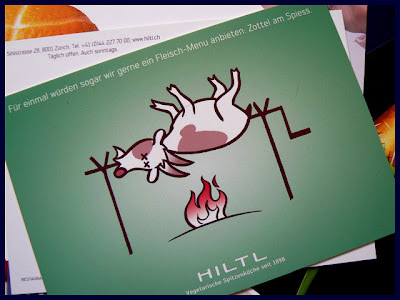 Hiltl is a vegetarian restaurant in Zürich, a place I like to go to a lot. They have interesting ad campaigns (see here), and they commissioned this Zottel-on-a-skewer postcard to show what their opinion is of SVP. It reads For once we're happy to offer meat: Grilled Zottel. Me too - I'm in Tibits most every morning. Haven't been in the new Hiltl since it re-opened. You're right about their advertising campaigns - very neat. NB did you get any photos of the ads they used in the run up to the reopening? Photos of people with their noses pressed up against the glass, making them look like porkers? A lot of humour in this notice. And good gift from that vegetarian restaurant.